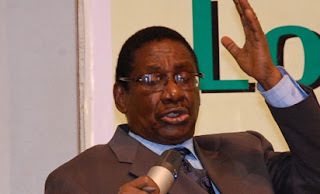 Prof. Itse Sagay, Chairman of the Presidential Advisory Committee Against Corruption (PACAC), has declared that heavens won’t fall if former President Olusegun Obasanjo “is prosecuted and jailed” should he be found guilty in the alleged misappropriation of public funds. Recall that Buhari had last week at the Presidential Villa, Abuja wondered what Obasanjo achieved after spending huge amount of dollars on power. But in a swift reaction, Obasanjo stated that he was ready for probe over the $16bn allegedly expended by his administration on power projects. However, the Economic and Financial Crimes Commission (EFCC) at the weekend said it has launched a probe into the controversy surrounding the $16 billion allegedly spent on electricity during the administration. of Obasanjo. Reacting to the face-off, Sagay wondered why Obasanjo has continued to criticize Buhari. “I think this tendency of putting your hands in the eyes of those who succeeded you really has to be stopped. His shenanigans has to be stopped. He went to Afenifere, a group he has had nothing to do with for years for support. He has to form some artificial party ADC and all sorts of ridiculous associations thinking he can destabilize this government when he was allowed a free reign as president.